I've watched the first four episodes of season 2 and found them a bit uneven. The first two I thought were pretty well done. 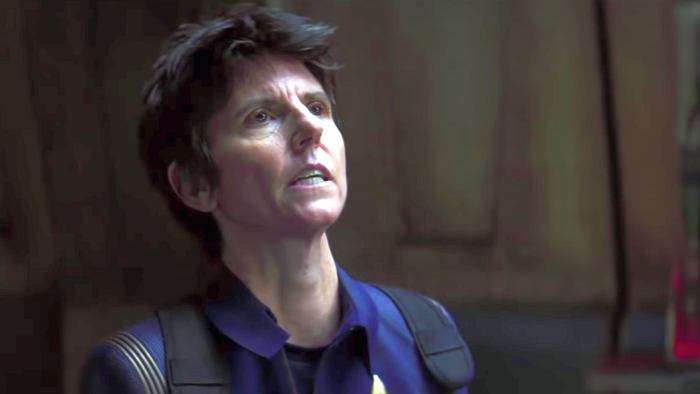 Stand up comic Tig Notaro was introduced as a ships' doctor and I hope she shows up as a regular. She was terrific...quirky and matter of fact and an interesting character. The story was well written and it was good to see Captain Pike take charge. Episodes 3 and 4 were a bit hectic and confusing....Why would Star Fleet put a Terran Empire ex-Emperor in such a vital role? The YouTube link of the first two episodes is no longer available, so hopefully you've seen them or you pick them up from some other site like Putlocker like I do. At least for the first season, the show is at best mediocre due to plot holes, awkward dialogue, etc. What's sad is that stories that make sense and character development are important aspects of TV shows but cost the least in terms of resources. I'll check out reviews and see if there are improvements before I decide to watch the second season. I watched the first few episodes with Bulldogtrekker, chatting on line, but I was so unimpressed I decided to wait a year or so and see if it grabbed me when I could binge watch it. The veteran actor behind countless fascinating creatures still loves playing the big moments of Saru's journey. Doug Jones doesn’t like to know what’s coming next for his characters. “I’m a one-week-at-a-time guy. If I know too much ahead… I don’t want that to inform how I play the scene today,” he said. 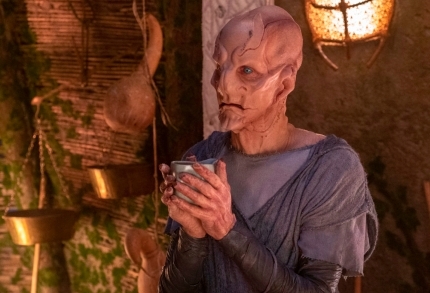 But after the dramatic events of Star Trek: Discovery Season 2 Episode 4, An Obol for Charon, Jones suspected that the writers would loop back around to Saru, who went through a near-death experience that had social media on red alert. The actor has become a legend for creating characters under layers of prosthetics in projects ranging from Buffy the Vampire Slayer to The Shape of Water. However, he said the challenge of Star Trek: Discovery doesn’t just lie with the long hours in the makeup chair, but in the scripts. Jones noted that he doesn’t often get a heads up from the producers when a big Saru episode is coming up. However, he did feel that if his character was about to get killed off, they’d let him know in advance. It’s a sacrifice that he deems worthy to play Saru. “I love him dearly,” he said. New episodes of Star Trek: Discovery Season 2 stream Thursdays on CBS All Access. And I LOVE the way you integrated those wonderful jpegs, along with your fine job of adding color to key words and phrases. 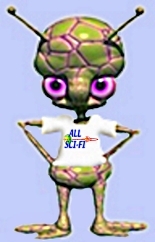 I read your post at 4:00 this afternoon (2-22-2019) and at that moment we had 22 guests on All Sci-Fi. I'll bet they all caught your new post and loved it. CBS All Access is beaming up Star Trek: Discovery for a third season, and adding a co-showrunner to help Alex Kurtzman. Michelle Paradise, who serves as co-executive producer for season 2, will join Kurtzman as co-showrunner for the upcoming third season. 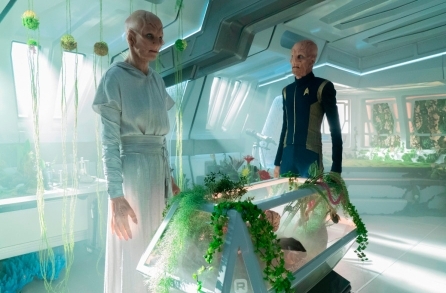 Paradise is taking some of the load off Kurtzman as he shepherds CBS All Access’ aggressive expansion of its Star Trek universe. Along with Star Trek: Discoveryy, CBS All Access has at least two more live-action series in various stages of development. At the end of this year, Sir Patrick Stewart will return as Captain Jean-Luc Picard, in a new series following his Star Trek: The Next Generation character. CBS All Access is also developing a series centered around Michelle Yeoh’s Philippa Georgiou character from Star Trek: Discovery. The small-but-growing streamer also has the animated Star Trek: Lower decks on the horizon, and is developing a second animated series. Additionally, CBS All Access has ordered two more installments of its Star Trek: Short Treks shortform series. 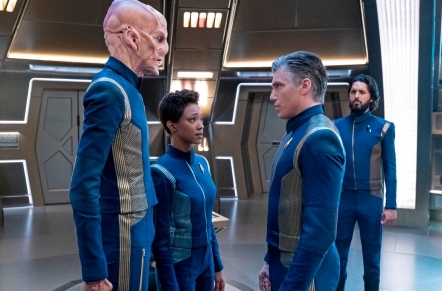 Star Trek: Discovery is currently in the middle of its second season, which premiered on Jan. 17. Season 2 saw the addition of classic Star Trek characters including Captain Christopher Pike (Anson Mount) and Spock (Ethan Peck). Paradise was previously a co-executive producer on The CW’s The Originals. 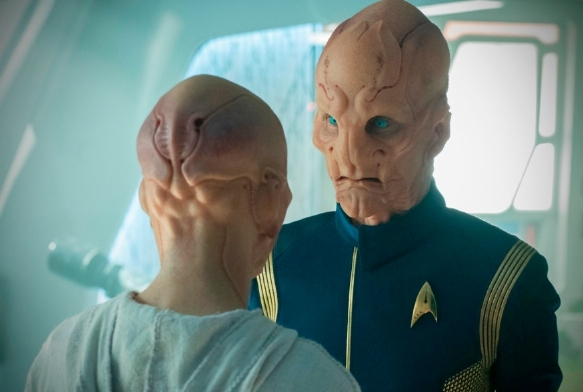 Star Trek: Discovery finally did the thing. 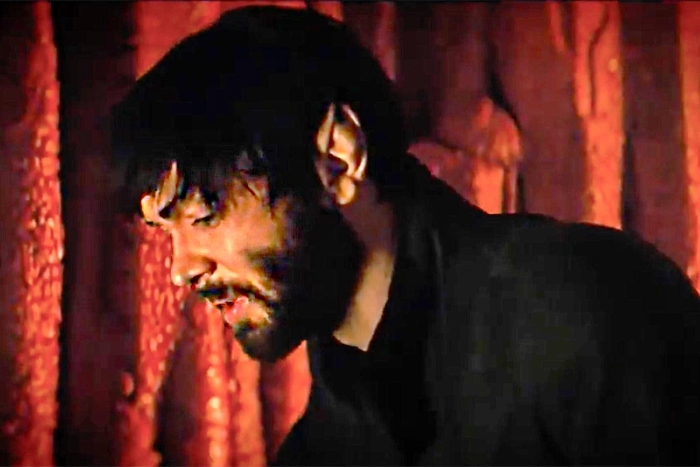 After much teasing, we got our first glimpse of Ethan Peck's Spock this week, and we learned surprising new details about the iconic character in the process. Showrunner Alex Kurtzman, who will share top duties with writer Michelle Paradise next season, teased a very different Spock, and he's stayed true to his word. While we hadn't seen Spock up until now, the series has painted a pretty clear picture of where he is in previous episodes. This is a conflicted Spock whose inability to grasp the logic behind apocalyptic visions of a Red Angel has essentially broken his brain. After checking himself into a psychiatric facility on Starbase 5, he subsequently broke free, allegedly killing several Starfleet officers in the process, and has been on the run as a wanted man ever since. Thursday's episode, titled Light and Shadows, tracked down the troubled Vulcan, who'd been hiding out on his home planet with help from his mother Amanda (Mia Kirshner). A stunned Burnham (Sonequa Martin-Green) found a disheveled Spock in a cave, feverishly uttering the First Doctrines of Logic over and over again while etching the same six numbers on the walls. A heated family debate between Burnham, Amanda and Sarek (James Frain) ended with Burnham turning Spock into Section 31's custody, where Leland (Alan Van Sprang) planned to extract his memories — a move that would have fried his brain. With help from Georgiou (Michelle Yeoh), Burnham and Spock were able to escape from the covert organization. Back on the run, Burnham finds herself headed to Talos IV in search of answers about her brother. We already knew that growing up as a half-human, half-Vulcan was difficult for Spock. However, it turns out there's more to the story. This week's episode revealed that he inherited a learning disability similar to dyslexia from his human mother, making it difficult to read and write. In an effort to help her son cope, Amanda read Alice in Wonderland to him — the same book she read to Burnham after her arrival. Repetitive mutterings aside, Spock's writings on the wall weren't total nonsense. As Burnham figured out, he'd been scribbling coordinates to the planet Talos IV, the home of the Talosians. It's unclear what business he might have with the big-brained, telepathic aliens, but now that Burnham set a course for the class M planet, we're close to getting answers. Spock wasn't exactly receptive to Burnham when Sarek and Amanda first brought her home. He slammed a door in her face when she extended her hand, setting the tone for a rocky relationship. Their years-long estrangement suggests things may not have improved much in that department. But a flashback showed at least one genuine moment between the pair, with Spock seemingly intrigued by his new adoptive sister. With Burnham fighting so hard to save him, it's clear that there's much more to this already complicated dynamic. I couldn't get the video to play at the site (only the audio played), but I found it on Youtube and posted it below. By the way, Spock mispronounced "sentient". He said it with a hard "T" sound — "sen-tee-unt". It actually rhymes with "patient", using an "sh" sound — "sen-shunt". "sen-tee-unt". It actually rhymes with "patient", using an "sh" sound — "sen-shunt". sen-tee-unt is from the original Latin and is (generally) the way it is pronounced in the UK. * US of A - "United States of America"; US of A - "Union of South Africa". By God, you are dead right, Miss Eade! You realize what this means, of course! Spock isn't Vulcan . . . he's British!